Virtual Private Network is shortly known as VPN and which has become more popular among the professional bloggers,webmasters and internet savvy.It is known to all that VPN service has been in use for many years. In fact, this popular way of providing secure communication across the Internet is one of the first resources that came into heavy usage when people started telecommuting. VPN software allows the user to utilize the Internet as a means of providing a secure connection to a business server or another resource that needs to be kept unavailable to the public at large. If the question is still on your mind that,Why would I even need one of these services?” In some cases, you may not even need VPN software at all. There are quite a few uses for the software, however, and you may find some of them compelling. If you own a business that you operate out of your home, this software can be particularly useful for you.Most VPNs worth their salt use at least 3DES (triple DES) or AES as encryption of the traffic between your laptop and wherever the endpoint VPN device that you are connecting to. There are several options to access your company's network or add security to a wireless connection while travelling. 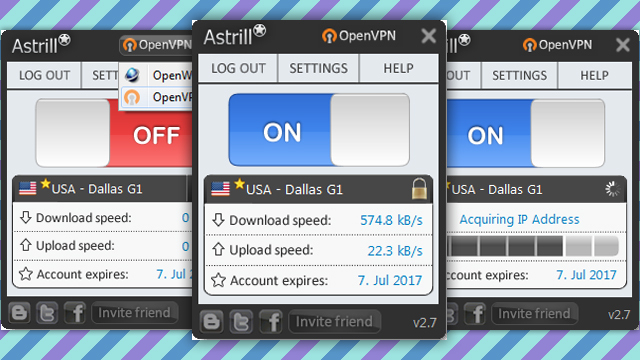 There are three types of VPN services are operating ,now this days.Those are Hardware based system,Firewall based VPN and Stand alone VPN application package.But security features differ from one to another where most of security experts agree that VPN includes encryption, strong authentication of remote user or host from potential attackers on the public networks.Here I am trying to find out the Special features of loving VPNs by the professional bloggers,webmasters and internet savvy . VPNs promise two main advantages over competing approaches -- cost savings, and scalability. One way a VPN lowers costs is by eliminating the need for expensive long-distance leased lines. With VPNs, an organization needs only a relatively short dedicated connection to the service provider. This connection could be a local leased line (much less expensive than a long-distance one), or it could be a local broadband connection such as DSL service.Another way VPNs reduce costs is by lessening the need for long-distance telephone charges for remote access. Recall that to provide remote access service, VPN clients need only call into the nearest service provider's access point. In some cases this may require a long distance call, but in many cases a local call will suffice. A third, more subtle way that VPNs may lower costs is through offloading of the support burden. With VPNs, the service provider rather than the organization must support dial-up access for example. Service providers can in theory charge much less for their support than it costs a company internally because the public provider's cost is shared amongst potentially thousands of customers. The cost to an organization of traditional leased lines may be reasonable at first but can increase exponentially as the organization grows. A company with two branch offices, for example, can deploy just one dedicated line to connect the two locations. If a third branch office needs to come online, just two additional lines will be required to directly connect that location to the other two systems either companies or firm or blog authors. Special features of loving VPNs by the professional bloggers,webmasters and internet savvy. i. Change Multiple ip address. With the hype that has surrounded VPNs historically, the potential pitfalls or "weak spots" in the VPN model can be easy to forget. These four concerns with VPN solutions are often raised. i. VPNs require an in-depth understanding of public network security issues and proper deployment of precautions. ii. The availability and performance of an organization's wide-area VPN (over the Internet in particular) depends on factors largely outside of their control. iii. VPN technologies from different vendors may not work well together due to immature standards. iv.VPNs need to accomodate protocols other than IP and existing ("legacy") internal network technology. Send confidential files without the fear of being hacked or interfered by any third party.VPNs that utilize the Internet avoid this problem by simply tapping into the geographically-distributed access already available.Generally speaking, these key factors comprise the "hidden costs" of a VPN solution. Whereas VPN advocates tout cost savings as the primary advantage of this technology, detractors cite hidden costs as the primary disadvantage of VPNs.Some cases are seen that encryption processors are used to minimize the impact of VPNs management on the system. Good write-up! I checked out something somewhat similar in a science site. Hello to every body, it's my first go to see of this blog; this weblog contains awesome and truly excellent data designed for readers.